John F. Kennedy flashes one last trademark grin at his BGSU supporters before leaving campus. All seats are filled as John F. Kennedy gives his speech at BGSU in 1959. John F. Kennedy signs an autograph for a supporter. Ralph McDonald and Carl H. Schwyn, Vice President of the Board of Trustees, in the background. 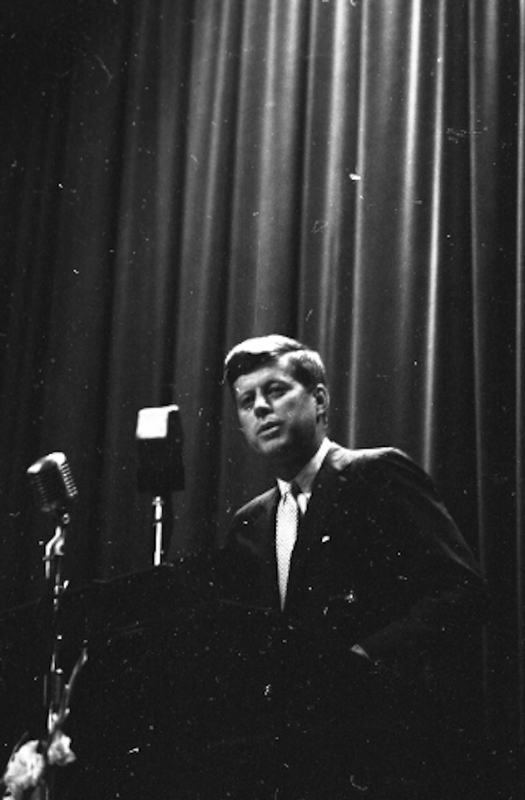 While he hadn't announced his candidacy yet, John F. Kennedy wasted no time in giving a speech to the campus of BGSU. John F. Kennedy giving his speech on the campus of BGSU in 1959. John F. Kennedy speaks with some supporters following his speech in 1959. Following his speech at BGSU, John F. Kennedy prepares to leave. Less than two years later, he'd be President of the United States.